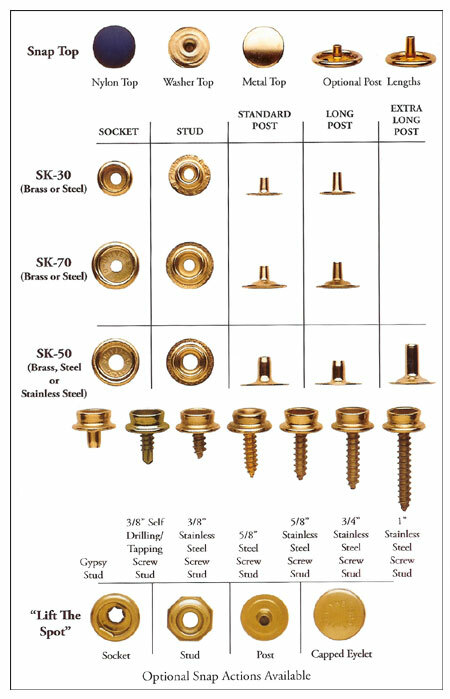 The "SK" snap system is designed for applications requiring a medium or heavy duty snap fastener. Available with 20, 24 or 27 ligne snap tops, either the SK-30, 70 or 50 are made in base materials of steel or brass. In addition SK-50 is also available in stainless steel. Depending on aesthetic requirements or functional demands, several metallic and oxidized finishes are available. For multiple stacking of components on top of each other, "gypsy studs" are available. For applications on hard surfaces, "screw studs" are an option. 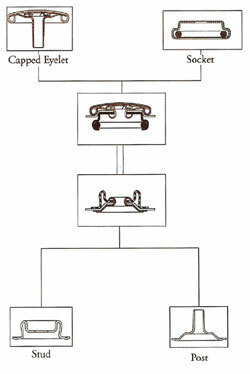 If your fastener needs call for a directional or one-way snap action, YKK Snap Fasteners America offers a specially designed system that resists unsnapping unless tension is applied from a specific direction ("Lift the Spot"). The SK-30 & 50 systems meet military specifications.